The American Registry for Internet Numbers or ARIN has put out a great little PDF you can download on how to get started with getting your first IPv6 allocation. For those who have not done this it can be useful to have an outline about what to expect in the process and this provides that. You can find the details for how this actually works on the ARIN website. I would expect most enterprises to fit in the /40 to /36 category as ARIN's definition of a site is relatively broad. They did this intentionally and as you can see in the definitions that follow, you can argue your single work from home user would classify as a site. A site is a discrete location that is part of an organization’s network. A campus with multiple buildings may be considered as one or multiple sites, based on the implementation of its network infrastructure. For a campus to be considered as multiple sites, reasonable technical documentation must be submitted describing how the network infrastructure is implemented in a manner equivalent to multiple sites. An organization may request up to a /48 for each site in its network, and any sites that will be operational within 12 months. In rare cases, an organization may request more than a /48 for an extra-large site which requires more than 16,384 /64 subnets. In such a case, a detailed subnet plan must be submitted for each extra-large site in an organization’s network. An extra-large site qualifies for the next larger prefix when the total subnet utilization exceeds 25%. Each extra-large site will be counted as an equivalent number of /48 standard sites." Remember, if you run labs, dev and test networks that might have to simulate an entire site then you need to include each of those as sites and not as a single /64 subnet in your design and request to ARIN. Otherwise you will not have enough address space to build out those test environments that you might require and you will have to go back to request address space. The IPv6 Show - IPv6 in the Enterprise? Why Bother? 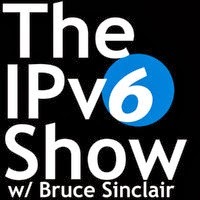 Bruce Sinclair with gogo6 is running a great podcast on IPv6. The IPv6 Show has had some fantastic guests already like Scott Hogg, Joe Klein, Jeff Doyle and Rene Paap. I've personally really enjoyed listening to the show and I encourage you to listen to past shows and to follow the podcast if you are interested in IPv6 at all. I was fortunate enough to have Bruce ask me onto the show so please have a listen. Click here to Subscribe to "The IPv6 Show" on iTunes! I am looking forward to hearing from other IPv6 industry experts that Bruce interviews in the future on the show, I think it is one to keep any eye on!